Name Variation Barbara Katherine Gall was also known as Katherine Barbara. Name Variation Barbara Katherine Gall was also known as Kate. Married Name 25 February 1923 As of 25 February 1923,her married name was Hoffman. She was the daughter of Balthaser James Gall and Magdalena Bentz. Barbara Katherine Gall married William Dean Hoffman on 25 February 1923 at Fairfax, Gregory, South Dakota. Barbara Katherine Gall died on 18 November 1996 at Fairfax, Gregory, South Dakota, at age 93. Barbara Katherine Gall obtained US Social Security Card at South Dakota; last residence Fairfax, Gregory, Fairfax, Gregory, South Dakota. [S9] South Dakota, South Dakota Birth Records South Dakota, State File Number: 578781 (unknown file date). [S244] U.S. Federal Census 1910 U.S. Federal Census, by Ancestry.com, ED22. Dwelling 3. [S243] U.S. Federal Census 1920 U.S. Federal Census, by Ancestry.com, ED62. Dwelling 102. William Dean Hoffman was born on 4 May 1898 at Fairfax, Gregory, South Dakota. He married Barbara Katherine Gall, daughter of Balthaser James Gall and Magdalena Bentz, on 25 February 1923 at Fairfax, Gregory, South Dakota. William Dean Hoffman died on 28 September 1972 at Fairfax, Gregory, South Dakota, at age 74. Married Name 21 September 1930 As of 21 September 1930,her married name was Wacker. Married Name 14 June 1955 As of 14 June 1955,her married name was Sanders. Clara Leone Gall was born on 25 November 1909 at Fairfax, Gregory, South Dakota. Clara Leone Gall married Erwin Frederick Gerald Wacker on 21 September 1930. Clara Leone Gall married Claget Thadeus Sanders on 14 June 1955 at Harlowtown, Montana. Clara Leone Gall died on 22 August 2000 at Kansas City, Missouri, at age 90. [S250] U.S. Federal Census 1930 U.S. Federal Census, by Ancestry.com, ED11. Dwelling 23. Claget Thadeus Sanders was born on 28 February 1914 at St. Maries, Idaho. He married Clara Leone Gall, daughter of Balthaser James Gall and Magdalena Bentz, on 14 June 1955 at Harlowtown, Montana. Claget Thadeus Sanders died on 8 February 2002 at Kansas City, Missouri, at age 87. Married Name 9 April 1937 As of 9 April 1937,her married name was Thurstenson. 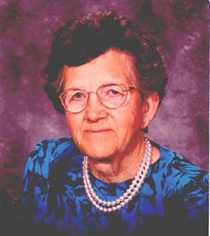 Elsie Lillian Gall was born on 9 April 1916 at Fairfax, Gregory, South Dakota. Elsie Lillian Gall married John Josef Thurstenson, son of Peter Thurstenson and Ida (? ), on 9 April 1937 John Josef met Elsie when she was working for her sister, Kate Hoffman, wife of William Hoffman, who lived across the road from the Thurstenson farm. Elsie Lillian Gall died on 27 March 2001 at Siloam Springs, Benton, Arkansas, at age 84. Elsie Lillian Gall obtained US Social Security Card at Nebraska; last residence Siloam Springs, Benton, Arkansas. John Josef Thurstenson was born on 14 November 1910 at Anoka, Nebraska. He was the son of Peter Thurstenson and Ida (?). John Josef Thurstenson married Elsie Lillian Gall, daughter of Balthaser James Gall and Magdalena Bentz, on 9 April 1937 John Josef met Elsie when she was working for her sister, Kate Hoffman, wife of William Hoffman, who lived across the road from the Thurstenson farm. John Josef Thurstenson died on 18 October 1996 at Siloam Springs, Benton, Arkansas, at age 85. Married Name 23 May 1944 As of 23 May 1944,her married name was Klundt. Doris Arlene Gall was born on 7 February 1924 at South Dakota. Doris Arlene Gall married Henry Peter Klundt on 23 May 1944 at Fairfax, Gregory, South Dakota. Doris Arlene Gall died on 17 August 1980 at age 56. Doris Arlene Gall obtained US Social Security Card at South Dakota; last residence Fairfax, Gregory, South Dakota. Henry Peter Klundt was born on 21 August 1918 at Herrick, Gregory, South Dakota. He married Doris Arlene Gall, daughter of Balthaser James Gall and Magdalena Bentz, on 23 May 1944 at Fairfax, Gregory, South Dakota. Henry Peter Klundt died on 18 May 1988 at New Hampshire at age 69. Name Variation Balthazar Gall was also known as George Balthazar. Name Variation Balthazar Gall was also known as Balthasar. Name Variation Balthazar Gall was also known as Balzer. Balthazar Gall was born in October 1843 at Worms, Odessa, Ukraine, Russia. He married Barbara Mayer in 1868 at Worms, Odessa, Ukraine, Russia. Balthazar Gall died after April 1910. Balthazar Gall and Barbara Mayer immigrated in 1874. [S246] U.S. Federal Census 1880 U.S. Federal Census, by Ancestry.com, ED29. Page 10. Dwelling 97. [S245] U.S. Federal Census 1900 U.S. Federal Census, by Ancestry.com, ED41. Dwelling 338. [S244] U.S. Federal Census 1910 U.S. Federal Census, by Ancestry.com, ED29. Dwelling 201. Name Variation Barbara Mayer was also known as Meyer. Name Variation Barbara Mayer was also known as Meier. Married Name 1868 As of 1868,her married name was Gall. Barbara Mayer was born in July 1847 at Worms, Odessa, Ukraine, Russia. She married Balthazar Gall in 1868 at Worms, Odessa, Ukraine, Russia. Barbara Mayer died after April 1910. Barbara Mayer and Balthazar Gall immigrated in 1874. Barbara Mayer had 10 with 8 living in 1900 children. She had 8 with 8 living in 1910 children. Name Variation Johanna Madgdalena Gall was also known as Jennie. She was the daughter of Balthazar Gall and Barbara Mayer. [S9] South Dakota, South Dakota Birth Records South Dakota, State File Number: 752440 (unknown file date). Married Name circa 1888 As of circa 1888,her married name was Neth. Barbara Gall was born in January 1869 at Worms, Odessa, Ukraine, Russia, also reported as Jan 1870. Barbara Gall married John Neth circa 1888. Barbara Gall died after 1910. Barbara Gall immigrated with Balthazar Gall and Barbara Mayer in 1874. Barbara Gall had 7 with 6 living in June 1900 children. Margaretha Gall was born in 1870 at Worms, Odessa, Ukraine, Russia. Margaretha Gall immigrated with Balthazar Gall and Barbara Mayer in 1874. Name Variation Christina Elvina Gall was also known as Tina. Name Variation Christina Elvina Gall was also known as Christine. Married Name circa 1896 As of circa 1896,her married name was Trautman. Christina Elvina Gall was born in March 1874 at Worms, Odessa, Ukraine, Russia. Christina Elvina Gall married Jacob William Trautman circa 1896. Christina Elvina Gall died after 1930. Christina Elvina Gall immigrated with Balthazar Gall and Barbara Mayer in 1874. Christina Elvina Gall had 3 with 3 living in 1900 children. Name Variation Johan Gall was also known as John. Johan Gall was born in February 1878 at Dakota Territory. He was the son of Balthazar Gall and Barbara Mayer. Johan Gall married Christina (?) circa 1898. [S245] U.S. Federal Census 1900 U.S. Federal Census, by Ancestry.com, ED41. Dwelling 345. Elizabeth Gall was born circa 1879 at Dakota Territory. Amelia Gall was born in July 1883 at South Dakota. Married Name circa 1898 As of circa 1898,her married name was Gall. Christina (?) was born in June 1880 at South Dakota. She married Johan Gall, son of Balthazar Gall and Barbara Mayer, circa 1898. Christina (?) had 1 with 1 living in 1900 children. Philip Gall was born in September 1899 at South Dakota. He was the son of Johan Gall and Christina (?). Peter Thurstenson married Ida (?). Peter Thurstenson was born on 6 February 1869 at Sweden. He died on 23 July 1941 at Boyd, Nebraska, at age 72. Married Name Her married name was Thurstenson. Ida (?) married Peter Thurstenson. Ida (?) was born on 23 February 1884 at Nebraska. She died on 28 June 1952 at Gregory, South Dakota, at age 68. Anna Marie Thurstenson was born on 8 September 1909. She was the daughter of Peter Thurstenson and Ida (?). Erwin Frederick Gerald Wacker was born circa 1906. He married Clara Leone Gall, daughter of Balthaser James Gall and Magdalena Bentz, on 21 September 1930. Erwin Frederick Gerald Wacker died on 24 October 1948 at Billings, Montana. Married Name 28 January 1881 As of 28 January 1881,her married name was Bentz. Christina Stroh was born on 15 August 1859 at Neudorf, Russia. She married Jacob Bentz, son of George Friedrich Bentz and Katharina Kirschenmann, on 18 January 1881 at Bergdorf, Russia. Christina Stroh died on 21 March 1936 at Fairfax, Gregory, South Dakota, at age 76. Married Name 13 November 1856 As of 13 November 1856,her married name was Bentz. Katharina Kirschenmann was born on 15 October 1837 at Neudorf, Russia. She married George Friedrich Bentz on 13 November 1856 at Glueckstal, Russia. Katharina Kirschenmann died on 15 August 1862 at Neudorf, Russia, at age 24. Name Variation Mary A. Noelle was also known as Marie. Married Name 7 June 1943 As of 7 June 1943,her married name was Kleinschmit. Mary A. Noelle was born on 6 May 1916 at Westfalen, Germany, also reported as 09 May 1916. She was the daughter of Frank Noelle and Theresia Tillmann. Mary A. Noelle married Cletus William Kleinschmit, son of Peter Kleinschmit and Gertrude Witte, on 7 June 1943 Cletus' brother, Gerald, and my sister, Dorothy, were our witnesses. Mary A. Noelle died on 11 November 2009 at age 93 Mary A. Kleinschmit, age 93 of Hartington, died Wednesday November 11, 2009 at the Avera Yankton Care Center in Yankton, SD. Mass of Christian burial will be on Saturday, November 14, 2009 at 10:30 a.m. at Holy Family (Sts. Peter & Paul) Catholic Church in Bow Valley with the Rev. Eric Olsen officiating. Burial will be at Sts. Peter & Paul Cemetery in Bow Valley. Visitation will be on Friday from 2-5:00 p.m. with a 3:00 p.m. rosary at the Wintz Funeral Home in Hartington. Visitation continues at the church at 6pm Friday with a Vigil Service at 7:30 p.m. There will be one hour of visitation at the church on Saturday prior to service time. To send an online sympathy card go to www.wintzrayfuneralhome.com . Pallbearers will be Cletus (Clay) Kleinschmit, Paul, Justin, Mark, Jim, Tom, and Nate Kleinschmit, and David Schock. Honorary pallbearers will be the Sts. Peter & Paul Rosary Club. Mary was born on May 6, 1916 at Bockum, Westfalen, Germany to Frank and Theresia (Tillman) Noelle. Her father, who had emigrated to the US from Germany and became a US citizen some two decades earlier, moved seven year-old Mary and her family to the US in 1923 aboard the SS. George Washington. The Noelle’s settled in rural Laurel, Nebraska where Frank had purchased a farm. Mary went to a country school through 8th grade, and “Catechism School” for two weeks in Wayne every summer. She went on to attend high school at St. Frances in Randolph, then to Wayne State College to earn a teaching certificate. Mary taught in several northern Cedar County schools, ending up in Fordyce, where she met Cletus Kleinschmit at a dance. Mary and Cletus were married on June 7, 1943 in Bow Valley. Mary and Cletus farmed together and raised five children in rural Bow Valley. Mary was a Renaissance Woman, intellectually curious and ready to learn about a variety of subjects. She was an excellent gardener, seamstress, amateur historian, baker, homemade ice cream maker, card and spider solitaire player, among other talents. Mary stayed connected to her family and friends in Germany, keeping an active correspondence with them, and in 1996, traveled back to Germany with her daughter to visit. Mary had a strong Catholic faith that she practiced daily. She was also very active in the church, participating in Christian Mothers (CCW), Catholic Daughters and Rosary Club, sewing blankets for the missions, baptismal garments for the parish, and burial garments for babies that were stillborn or miscarried. In her earlier days, Mary also transported Franciscan teaching Sisters to various destinations. She was part of the committee that researched and wrote a history of Ss. Peter and Paul Catholic Church to commemorate in 2001 the 125th anniversary of the parish. In later years, Mary wrote a comprehensive history of her family and life that she shared with her children and grandchildren: The best Christmas present she ever gave. Mary is survived by 5 children and their spouses, William and Elizabeth Kleinschmit of Bow Valley, Edwin and Carolyn Kleinschmit of Crofton, Martin and Linda Kleinschmit of Bow Valley, Lois and Irvin Schock of Dakota City, and Roger and Debra Kleinschmit of Canton, SD; 23 grandchildren, 34 great-grandchildren, and a sister, Dorothy and Mike Gubbels of Columbus. Mary was preceded in death by her parents, husband Cletus who died on March 9, 1994 at age 75, sisters Sr. Theresa, Frances, and Elsie Noelle May, brothers Frank and Henry; and a great-grandson Dalton Gall. At wrote biography which is available at http://marykleinschmit.com/ Mary's Book - Memories of a German Girl in America. Mary A. Noelle immigrated with Frank Noelle and Theresia Tillmann on 15 June 1923 at arrived on the S.S. George Washington; final destination Wayne County, Nebraska. [S250] U.S. Federal Census 1930 U.S. Federal Census, by Ancestry.com, ED18. Dwelling 34. Married Name 8 October 1940 As of 8 October 1940,her married name was Pinkelman. Mildred Veronica Duman was born on 25 January 1919 at South Dakota. She was the daughter of Benjamin Duman and Leona Wiebelhaus. Mildred Veronica Duman married Julius Fritz Pinkelman, son of Jacob Pinkelman and Emma Schroeder, on 8 October 1940. Mildred Veronica Duman died on 9 April 2007 at age 88 Mildred V. Pinkelman, 88 and formerly of Wynot, Nebraska, died on Monday, April 9, 2007 at Avera Sacred Heart Hospital in Yankton, SD Mass of Christian Burial will be on Friday, April 13, 2007 at 10:30 a.m. at Holy Family (Sacred Heart) Catholic Church in Wynot, NE with the Rev. Charles Duman and Rev. Michael Keating officiating. Burial will be at the Sts. Philip and James Cemetery in St. James, NE. Visitation will be on Thursday from 1-5:30 a.m. with a rosary at 2:00 p.m. at the Wintz Funeral Home in Hartington. There will be a Vigil Service at 7:30 p.m. at the Church in Wynot on Thursday. Pallbearers will be Eric Melstad, Tony Pinkelman, Lee Wilwerding, Tom DeBlauw, Phillip Pinkelman, Gregory Kleinschmit, Tom Pinkelman, Nick Suing, Vincent Pinkelman, Jacob Pinkelman, Wesley Pinkleman, Jon Pinkelman. Honorary Pallbearers will be all the remaining grandchildren. Mildred Veronica Pinkelman was born on January 25, 1919 in Yankton, SD to Ben and Leona (Wiebelhaus) Duman. She grew up in the Hartington and Wynot area and graduated from Wynot High School. She worked as a nurse's aide at St. Lukes Hospital in Sioux City, IA and also as a housekeeper for a family in Sioux City prior to her marriage. Mildred married Julius Fritz Pinkelman on October 8, 1940 in St. James, NE. She and Julius farmed east of St. James until Julius retired in 1983. They then moved to Wynot. Julius died on February 26, 2000 at the age of 83 years. Mildred moved to Yankton in 2000 and remained there until her death. She was a former member of the Sts. Philip and James Catholic Church in St. James and the Ladies Guild, Legion of Mary. Mildred loved her family and grandchildren. She had a great sense of humor and was always a very giving person. She played the piano by ear, loved to laugh, read, and garden. She also was very fond of her chicken collection. Mildred is survived by her 12 children and their spouses; Kenneth and Rose Pinkelman of Wynot, Ruth and Gail Wilwerding of Davenport, IA, Barbara and Leon Melstad of Hot Springs, SD, Robert and Linda Pinkelman of Ponca, NE, Elizabeth and William Kleinschmit of Hartington, Michael and Janet Pinkelman of Brewster, KS, Dorothy and Don DeBlauw of Healy, Alaska, Russell and Jeannie Pinkelman of Delta Junction, Alaska, Donald and Darla Pinkelman of Fremont, NE, Eugene and Gerri Pinkelman of Wynot, John and Jean Pinkelman of Fordyce, Joan and Duane Suing of Crofton; 38 grandchildren, 18 great grandchildren, 2 brothers, Rev. Charles Duman of Salem, SD, George Duman of Omaha, NE; 1 sister, Marge Seiler of Sioux City, IA. Preceding Mildred in death were her parents, husband Julius, 6 month old daughter, Mary Frances, great grandson, Dalton Gall, 2 sisters, Mercedes Goedert, and Maureen Pinkelman. [S250] U.S. Federal Census 1930 U.S. Federal Census, by Ancestry.com, ED8. Dwelling 51. Julius Fritz Pinkelman was born on 2 May 1916 at Nebraska. He was the son of Jacob Pinkelman and Emma Schroeder. Julius Fritz Pinkelman married Mildred Veronica Duman, daughter of Benjamin Duman and Leona Wiebelhaus, on 8 October 1940. Julius Fritz Pinkelman died on 26 February 2000 at age 83 Julius F. Pinkelman, 83, died Feb. 26,2000, at St. Luke's Regional Medical Center, Sioux City, Iowa. Visitation was Feb. 29 at the Wintz Funeral Home, Hartington. A vigil service was held later that evening at Sts. Philip and James Catholic Church, St. James. Mass of Christian Burial will be March 1 at Sts. Philip and James Catholic Church at 10 a.m. with Rev. Jay Kruse officiating. Burial will be in Sts. Philip and James Cemetery, St. James. Pallbearers will be Tony Pinkelman, Jim Pinkelman, Phillip Pinkelman, Jack DeBlauw, Greg Kleinschmit and Jacob Pinkelman. Honorary pallbearers will be the remaining 32 grandchildren. Julius was born May 2, 1916, to Jacob and Emma (Schroeder) in Wynot. He married Mildred Duman Oct. 8, 1940, in St. James. He lived in the Wynot area all of his life. He farmed east of St. James until 1983, when he retired and moved to Wynot. He was a lifelong member of Sts. Philip and James Catholic Church and a member of the Catholic Order of Foresters. Survivors include his wife, Mildred, Wynot; 12 children and spouses, Kenneth and Rose Pinkelman, Wynot; Ruth and Gail Wilwerding, Davenport, Iowa: Barbara and Leon Melstad, Hot Springs, S.D; Robert and Linda Pinkelman, Ponca; Elizabeth and William Kleinschmit, Hartington; Michael and Janet Pinkelman, Crofton; Dorothy and Don DeBlauw, Healy, Alaska; Russell and Jeannie Pinkelman, Delta Junction, Alaska; Donald and Darla Pinkelman, Fremont; Eugene and Gerri Pinkelman, Wynot; John and Jean Pinkelman, Fordyce: Joan and Duane Suing, Crofton; 38 grandchildren; and eight great-grandchildren. He was preceded in death by his parents; a six month old daughter, Mary Frances; three brothers, Arthur, Leonard and Edwin Pinkelman; and a sister, Irene Kleinschmit. Wednesday, March 1, 2000-CEDAR COUNTY NEWS. Julius Fritz Pinkelman obtained US Social Security Card at Nebraska; last residence Wynot, Cedar, Nebraska. [S243] U.S. Federal Census 1920 U.S. Federal Census, by Ancestry.com, Year: 1920;Census Place: Precinct 7, Cedar, Nebraska; Roll: T625_983; Page: 58A; Enumeration District: 42; Image: 102. [S250] U.S. Federal Census 1930 U.S. Federal Census, by Ancestry.com, ED10. Dwelling 88. Peter Kleinschmit was born on 14 April 1870 at Nebraska also reported as Wisconsin. He was the son of Johann Peter Kleinschmit and Elizabeth Schaefer. Peter Kleinschmit married Gertrude Witte, daughter of Herman Witte and Gertrude Rupiper, in 1898 at Cedar, Nebraska, license issued May 19, 1898. Peter Kleinschmit died on 2 February 1923 at Sioux City, Woodbury, Iowa, at age 52. [S247] U.S. Federal Census 1870 U.S. Federal Census, by Ancestry.com, Stamp 131. Dwelling 936. Page 15. [S246] U.S. Federal Census 1880 U.S. Federal Census, by Ancestry.com. [S245] U.S. Federal Census 1900 U.S. Federal Census, by Ancestry.com, ED35. Dwelling 92. [S244] U.S. Federal Census 1910 U.S. Federal Census, by Ancestry.com, ED34. Dwelling 68. [S243] U.S. Federal Census 1920 U.S. Federal Census, by Ancestry.com, ED41. Dwelling 49. Married Name 1898 As of 1898,her married name was Kleinschmit. Gertrude Witte was born on 7 June 1881 at Nebraska. She was the daughter of Herman Witte and Gertrude Rupiper. 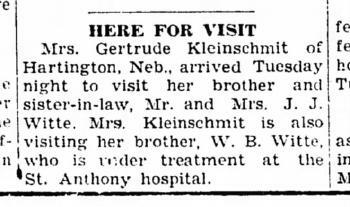 Gertrude Witte married Peter Kleinschmit, son of Johann Peter Kleinschmit and Elizabeth Schaefer, in 1898 at Cedar, Nebraska, license issued May 19, 1898. Gertrude Witte died on 2 January 1963 at age 81. Gertrude Witte had 2 with 0 living in 1900 children. She had 8 with 6 living in 1910 children. 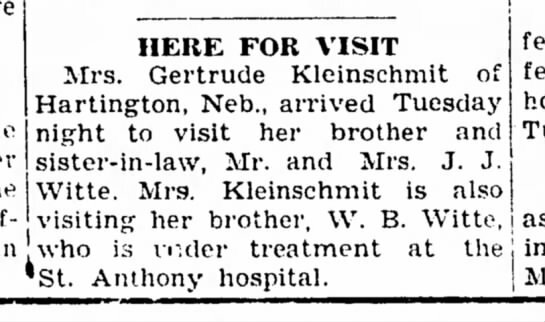 On 19 January 1938 at Mrs. Gertrude Kleinschmit visiting brothers J. J. Witte and W. B. Witte. [S250] U.S. Federal Census 1930 U.S. Federal Census, by Ancestry.com, ED5. Dwelling 57. [S373] U.S. Federal Census 1940 U.S. Federal Census, by Ancestry.com, Year: 1940; Census Place: , Cedar, Nebraska; Roll: T627_2240; Page: 4A; Enumeration District: 14-5.